Leaves are starting to hit the ground as the days grow shorter. But, Novato’s hot market shows no signs of cooling down. In October 2009, 50 Novato, California homes sold, compared with 35 sales in September 2009. Suffice it to say, the Novato real estate market is hot. Entry level home sales have shown sustained strength for the past 6 months. The number of homes actively listed in Novato remains very low compared with the rest of Marin (and the percentage of homes in escrow remains much higher than the rest of Marin). This exceptional demand is based on stunning affordability (homes are selling now for prices nobody could have dreamed of 3 short years ago) and the fantastically low interest rates. While the average sales price of Novato homes rose in August to a remarkable $713,440 (based in large part on the makeup of sales), that number fell back to Earth in September — $646,389. Last month, the average sales price rose to $667,788. Certain zip codes are performing exceptionally well. For example, in 94949 (Southern Novato) the percentage of homes in escrow is up 38% from last October and the average days on market is down 70%. This is simple supply and demand. Savvy buyers waiting for “the bottom to hit” recognize that we may be there and that any further price erosion will be outweighed by increased interest rates which are likely around the bend. Surely, home buyers in Novato are finding that it is increasingly difficult to identify “turnkey” homes under $550,000. In the 94949 zip code, median prices year over year dipped a mere 3%. I think many observers would be surprised. Local agents are all talking about a “bounce” in prices over the past several months. In fact, more homes sold in October 2009 in the $1 million to $1.5 million price band in Novato than sold in Mill Valley in that same price band. I have been saying for years that the Novato luxury market is on the rise and we are seeing tangible sales figures support my predictions. This trend also coincides with the extraordinary high percentages of homes in escrow. Meanwhile, inventory continues to shrink with just 117 single family homes currently for sale in Novato, CA. Novato homes that sold in October 2009 averaged 100 days on market, were about 2,267 sq. ft., and sold for an average sales price of $667,788 (roughly $310 per sq. ft.). Novato’s absorption rate (e.g., the number of months of inventory currently available in Novato) has dipped to historically low levels — just 2.3 months worth of available inventory overall. The chart below reflects activity in the $800,000 to $900,000 price band. In this “move-up” price band, there is less than 2 month’s inventory. Lower price bands are even more constrained. 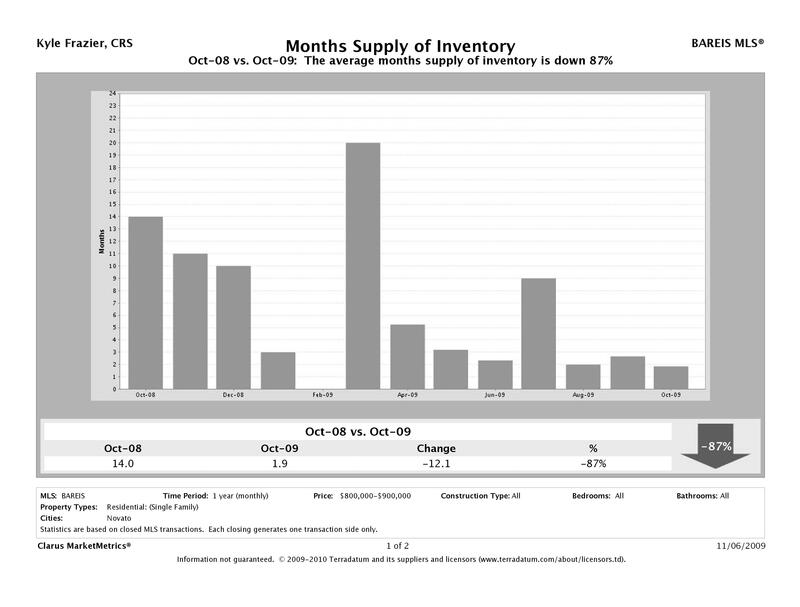 Generally speaking, 5-6 months of inventory reflects a balanced market and anything under 4 months, a seller’s market. An aging public pool at Hamilton Field, Novato is almost ready for a grand debut after a $5 million renovation. The pool is located across from Hamilton Field’s “The Landing at Hamilton” new home development (which is set to break ground in coming months) and the existing neighborhood of South Gate. The renovation was approved unanimously by the Novato City Council in November 2007 and final plans were approved in March 2008. The leaky old pool was not compliant with the Americans with Disabilities Act and access to its bathhouse was restricted by the Marin County health department. The revamped facility at 206 El Bonito Road includes a main pool of 185,000 gallons and a shallow pool of 12,000 gallons. There is new decking, piping, lighting and landscaping plus bathhouses. Solar power and water leaks that have been fixed will lead to considerable savings compared with costs of the old pool, but the city will have to pay the water bill that was previously paid by the U.S. Coast Guard. Traditionally, Hamilton Pool has been open Memorial Day through the end of September. If a private operator is signed to a contract, it could be open year-round, Shinault said. The above information was derived from an article in the Marin Independent Journal, 10/30/09. If you have any questions relating to Novato real estate, call Kyle Frazier at (415) 350-9440. Marin County, California real estate held steady, for the most part, through Summer 2009. While year over year prices are down across the board no matter how you slice it, many feel as though absent further crisis, we may be nearing the end of the downward cycle — after a full 3 years. Certainly, well priced, updated homes in great locations are selling promptly. In Northern Marin (a.k.a Novato), 81% of homes priced under $500,000 are in escrow (that’s 39 out of 48 homes!). In San Rafael, 64% of homes priced at or below $600,000 are in escrow. These astonishing sales numbers are propelled by value / affordability, the $8,000 tax credit, and the increased FHA loan limits which went into effect in April 2009. Meanwhile, the higher price bands look a little different. As noted last month, some sellers still suffer from pricing strategies that prevent them from realistically engaging with qualified buyers. Nonetheless, we have well over a dozen $2 million and up properties in escrow and have seen a few BIG sales over the Summer. Should the stock market recover further in coming months, I predict more Winter sales as affluent buyers step into the market with renewed confidence. Social proof is a powerful force. [Click HERE for the rest of the article, courtesy of www.NorthBayRE.com]. Reflecting on the past twelve months, Marin County real estate markets experienced the most difficult and unpredictable dynamics. The financial markets imploded, unemployment trends accelerated and consumer confidence was shattered. And while we benefit from historically low interest rates, credit requirements, approval guidelines, and loan to value ratios are as stringent as in recent memory. The good news is that over 1,100 single family homes have sold in Marin County in the first nine months of 2009. Successful sellers have processed market dynamics, followed their real estate advisors recommendations and successfully made housing decisions to support their lifestyle. Buyers continue to seek opportunity and will write offers only on the homes that have balanced the best pricing in relation to the relevant and recent neighborhood comparables. [Click HERE for the rest of the article, courtesy of www.ImagineMarin.com].